The Cover Contessa: Interlopers Release Blitz and Scavenger Hunt! 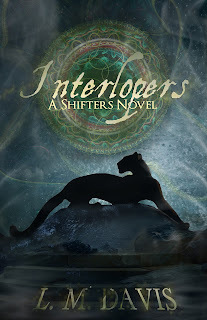 Interlopers Release Blitz and Scavenger Hunt! However, disturbing things are starting to happen--both at home and at school. And when their parents go missing and a strange messenger appears, they discover that the only way to save them is by breaking all the rules. Bio: L. M. Davis loves great storytelling. She needs nothing more than a good book and a comfy chair to be happy. She was born in the south, raised in the north, and has a few degrees under her belt. She still hasn’t gotten her black cat, but she thinks about it everyday. Her thoughts go something like this: "I really should get a cat." For now, she contents herself with spoiling the pets of her friends and family. The first two books of her Shifters Novel Series, Interlopers and Posers, are available now. To find out more, visit www.shiftersnovelseries.com. Thanks for hosting my Book Birthday Cover Reveal & Scavenger Hunt!